Weird & amazing facts about the human body! 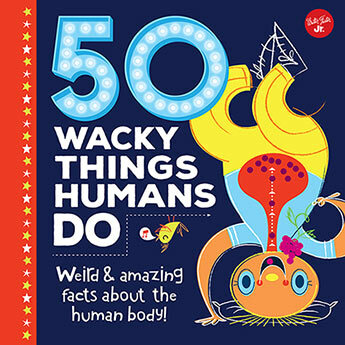 50 Wacky Things Humans Do describes 50 weird, wild, and unbelievable things the human body does. Science has never been so much fun! Did you know that a sneeze moves at about 100 mph? Or that an average person is 7.5 heads tall? Did you know that humans share 99.9 percent of their DNA with each other? 50 Wacky Things Humans Do describes 50 unbelievably weird things about the human body that seem too crazy to be true, but are! Whether amazing, silly, or just plain gross, these peculiar and fascinating things about the human body will surprise and delight fun-fact lovers of all ages.